Padraig Harrington is an Irish professional golfer who plays on the European Tour and the PGA Tour. He has won three major championships: The Open Championship in 2007 and 2008 and the PGA Championship, also in 2008. 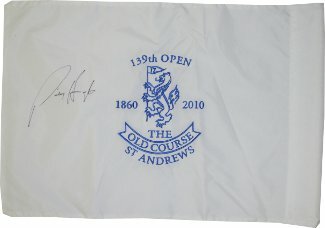 Padraig Harrington has hand signed this 2010 Open Championship (British Open) Flag at Old Course at St Andrews. Beckett Authentication Services Hologram and Certificate of Authenticity.